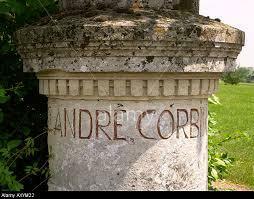 Château Saint Andre Corbin is located in Bordeaux's smallest appellation just north of the village of Saint Emilion. Both the estate and vineyards date to the Gallo-Roman epoch. Letters from the Roman Consul and poet Ausonius to Rome indicate that wine from this estate was served at Julius Cesar's table in the 4th century. Archaeological evidence suggests that the current château is built over the original Ausonius Villa. (The famous Château Ausone did not exist prior to the 18th century.) Extensive archaeological excavations at Château Saint Andre Corbin have resulted in spectacular discoveries, including an intact Venus, which is in the Museum of Aquitaine in Bordeaux, and an intact Diana, which now resides in the Louvre Museum in Paris. Wine Enthusiast 91From the smallest of the Saint-Emilion satellite villages, this wine has swathes of black fruit aromas that go well with its firm tannins, dense blackberry flavors and concentration. Ripe Merlot dominates the blend, giving both structure and fruit. Wine Spectator 90"This is packed with blackberry, blueberry and black currant fruit, all framed with a mouthwatering, well integrated apple wood note. Displays a dark, grippy finish. Still a touch chewy around the edges, but the fruit is polished at the core. 500 cs imported."